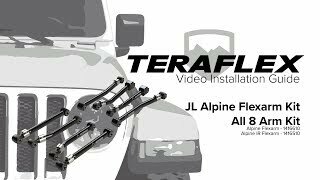 TeraFlex JL/JLU Alpine Flexarm adjustable control arms provide maximum adjustability, dependability, and performance while retaining factory control arm mounting locations on JL/JLU Wrangler models with 0-4.5” lifts. Features factory-style bushings. Can be added to any existing suspension lift.